You will be arrived at sawai Madhopur railway station and transfer to your pre booked hotel or wildlife Resort in Ranthambore. After check in freshen up and take lunch.After lunch visit to Ranthambore Fort. it will take approx two hours to complete, return at you hotel at dusk. Have tea and coffee. After shower ready for dinner and over night spent in the hotel or resort. 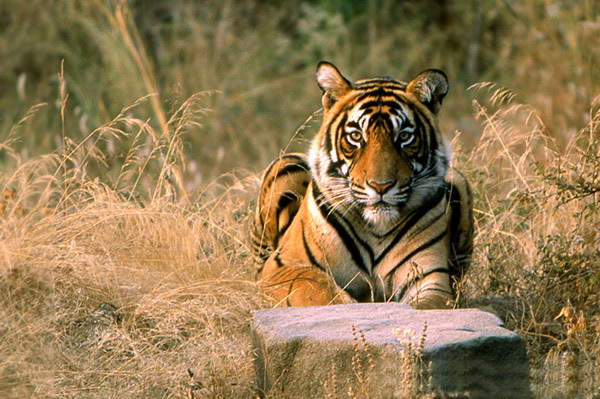 An early morning drive to the dense jungle of Ranthambore with naturalist by open top roof canter or jeep (subject to availability) for tiger tracking and explore wildlife.The jungle visits lasts for about three hours. Return to the resort for breakfast time.There is time to relax and enjoy the facilities of your hotel, maybe take a dip in the pool for a break from the heat of the day.You can also explore the wild surroundings.After luch you will take afternoon game drive to ranthambore National Park with naturalist by jeep or canter. Dinner and overnight stay at the resort in Ranthambore. After delightful Break fast check-out and depart to railway station time to catch train for Delhi / Onward Destination and home. 02 times Jungle Safari as per the itinerary. National Park permit, Entry fees. Forest expert guide at the time of Safari. The above proposed tour can be customized as per your need and requirements.